I have been working on this top for my girl since the beginning of May. I have to say I’m not 100% hapy with it – it’s a bit too narrow, and the yoke is clumsy. I could also have done one button hole more – it would probably fit better… But little L loves it, so that’s the main thing. Since I’m not too satisfied, I don’t think I’m going to publish the pattern, but if anyone’s interested I guess I could share some guidelines – let me know. Separator image Posted in My kniting & crochet and tagged with crochet, crochet top, Riviera Waves, YOP. What a really pretty top and with little L loving it that is all that matters. 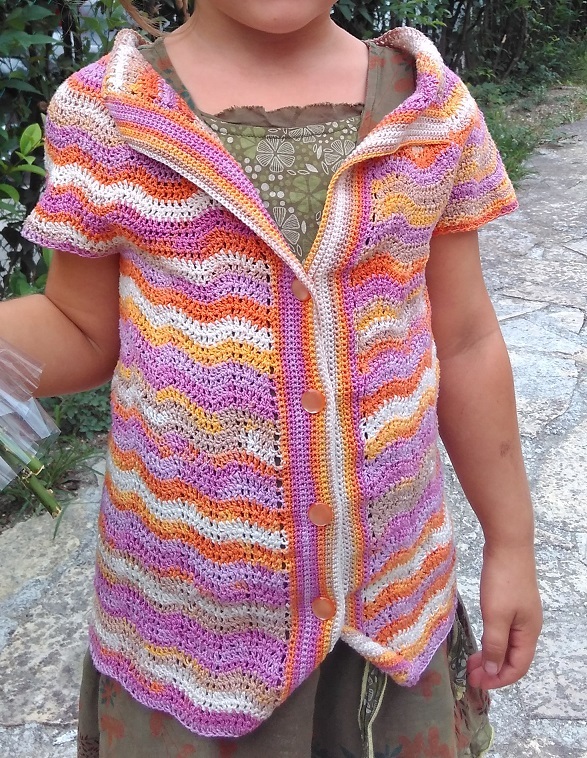 Beautiful colours in a gorgeous little top – she looks very pleased with it! It is a darling little top, the colors are so pretty. She looks adorable in it and the colours are wonderful. Maybe you need to take a step back to evaluate what you like and don’t like before you make a final decision on the pattern? I really like the contrast between the straight vertical button bands and the horizontal ripples of the body, and I really like the shawl colour look. It all works so beautifully with the variegation in the yarn! Maybe do the sleeves differently? I think, in this case, since your daughter loves it, that is what counts. But I’d agree, the yoke – and perhaps the bottom R doesn’t quite match up? that may just be the photo. I think it is a great color – and the recipient is happy. if you want to publish pattern, perhaps work a bit on that yoke and hem? But it’s a lovely project that pleases the child and that counts for so much! She looks precious! Yes, yoke is definitely not what I intended. What do you mean by bottom not matching? Do you think it needs edging? In any case, I now share my patterns for free, so I don’t think I’m going to make another sample to fix the yoke and other small bits, so many new projects calling me! Adorable sweater. The colors are fantastic. It’s amazing how kids love something but the parent/creator can always find something to fix? Thank you :) You are right, children are not picky at all, they just like the fact that you spent time and effort and something specially for them – I least mine do. Oh what pretty colours – it’s a lovely use of variegated yarn and if she loves it then it’s definitely a win! Aww, it’s very pretty. Glad she loves it too! Oh, I think it looks very sweet. Love the colors too. It’s beautiful and such lovely bright colours.